People turn to different things to self-medicate their anxiety. One only has to open Facebook or Instagram for a fleeting moment to see about six different memes about moms downing chocolate or having a glass of wine the moment their children go to bed, and those are among the more innocuous forms of self medication. That doesn’t even touch the number of Americans who are on some sort of prescription anxiety medication. Wouldn’t it be nice if there were a natural, safe way to ‘medicate’ anxiety? 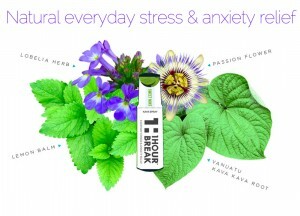 According to the minds behind 1Hour Break, an all-natural spray made from Kava Kava root, Lobelia, Passion Flower, and Lemon Balm, such relief is possible. Check out their Indiegogo campaign, which launches today, March 25th, for more information. For even more fanfare, join Mamavation twitter party , during which you can win your very own sample of 1Hour Break to try for yourself. Do you suffer from stress or anxiety? Let’s bring discussions of stress and anxiety into the open. Share your story in the comments and check out the infographic below for more about stress and the healing herbs behind 1Hour Break. This entry was posted in Health, Products and tagged 1hour break, mamavation, natural stress relief by jessica. Bookmark the permalink.